You know, I feel like the last few “Zelda” games have hinged on an axis mechanism that the game is organized around. Whether it’s “Twilight Princess” with the light and dark, or “Wind Waker” with the sailing. Do you feel like there is a core part of the series at this point? Reggie: I think it is. The earlier games were more about straight RPG-style dungeon crawler gameplay. Reggie: Well, in “Link to the Past”, you had light and dark, too. That’s true. And in “Ocarina of Time,” you had the different time periods and Link at different ages as the core mechanic in that game. Reggie: So, these two worlds are a key part of the Zelda franchise. And you know, being able to do certain things in world, different things in the other world—now, Mr. Newman, Mr. Miyamoto are the developers—but as a player, a lover of the franchise, to me, yes, those are core parts of the franchise. The idea or concept of the eliminating RPG elements in favor of more “traditional” adventure gameplay has been happening a lot in the series over the last 20 years. Still it is interesting watching things be about light and dark, or be so heavily focused on one element (IE sailing, train). Hop inside to see what Reggie had to say about Skyward Sword. You know, you opened with Zelda, which set the tone. In previous years, it would have been the last thing you guys went to—and that was really impressive. “The Legend of Zelda: Skyward Sword” uses motion control, and the last time you and I spoke at GDC, we were talking about motion control and the approaches from the other companies. Clearly, at lot more has been revealed as of E3. I talked to (Nintendo global president Satoru) Iwata and he makes it clear that Nintendo is not a company that responds to competitors. But can you offer any opinions about how you feel, as far as Sony and Microsoft implementing their idea of motion control? Reggie: I really can’t, and that’s because while I have seen people play their products, I haven’t played it personally. One player hasn’t announced their pricing strategy, so that’s a big [component that’s] missing still. What I can say is that I believe the consumer knows which company has been the innovator in this space. I also believe that we have demonstrated with “Zelda: Skyward Sword” how a one-to-one controller can bring you deeper into a true active gaming experience, and no one else has done that. No one. We will continue to innovate, we’ll continue to bring consumers closer and closer into the experience. And we believe that if we do that, the consumer will vote with their wallets and pocketbooks and continue to show that Nintendo is the company bringing these great experiences forward. 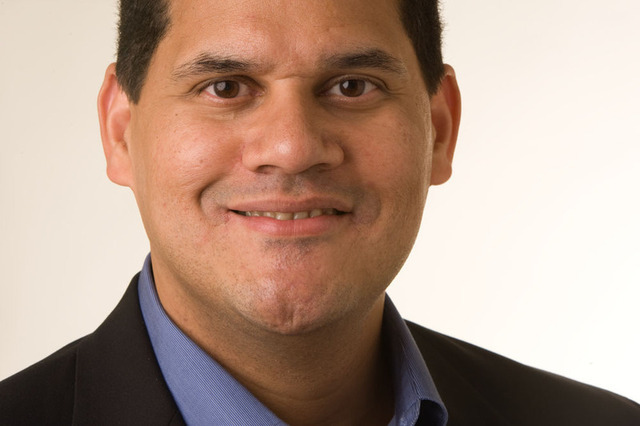 Reggie: I’ll tell you: I’m a longtime “Zelda” fan. I played “Zelda” before I ever considered that I could be working for the company. I cut my teeth on “Link to the Past.” I’ve picked up that control scheme and it feels like a great “Zelda” game. I mean now, I have the sword and shield. I am the one deciding how to attack a particular enemy. It feels great to me. I found that it’s a fantastic new way to experience the “Zelda” franchise. Reggie: Right, all the way to the “realism” of “Twilight Princess” and everything between. I think it’s great, I think it’s what helps keep the franchise fresh. Is there a bit of a teaser with regard to what we saw on the trailer, and in the name “Skyward Sword”? It seems to indicate that there might be some kind of vehicular element or something. Reggie: [At] the developer roundtable, Mr. Aonuma shared the skyward element of this game. The storyline goes that Link is living in a cloud world and finds a way to go down to the ground. And the gameplay will take you between this ground world and the sky world. Reggie: So that’s the traversal. It is interesting that Reggie felt he had to repeat what he said previously about being a longtime fan, but it was a nice little debate either way about the direction Zelda is heading in. The interview did contain some additional things such as Reggie’s thoughts on the competition from a technological stand point, so you can read the rest of the interview if you please over at IFC.